CONGRATS TO DESIREE DUNBAR and BETTYCD! "Robert Rothschild Farm, a family-founded company in Urbana, Ohio, is the purveyor of award-winning specialty foods including preserves, mustards, dips, sauces and sweet toppings. Recognized for bold flavors and expert blending, our open and serve products are ideal for busy, yet discerning hosts and cooks." "The sweet-tart flavor of cherries and pomegranate complement the heat of habanero peppers. •Marinate, grill or baste meats with this innovative sauce. •Simmer with cocktail meatballs for a crowd pleaser! What we thought: This sauce provided a spicy sweetness that was really yummy! We used it as the simmering sauce for cocktail weenies at a football get-together and everyone raved over them. As a testament to the goodness of this sauce, the full crock pot was completely empty by the 4th quarter! This is another great gourmet sauce from Robert Rothschild Farm! ABCD Diaries gives the Cherry Pomegranate Habanero sauce an A+! Buy It: Find this yummy sauce and many more at Robert Rothschild Farm. 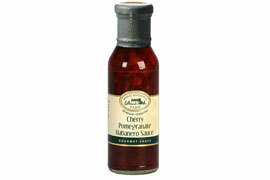 Win It: Robert Rothschild Farm has generously offered two ABCD Diaries readers a bottle of Cherry Pomegranate Habanero Sauce! To enter, follow our blog via GFC. Disclosure: ABCD Diaries was given sauce for review purposes only. We were in no other way compensated. The opinions expressed in this post are ours and ours alone. I like abcd diaries on facebook as m patricia gabriel. I entered the Tukaiz giveaway. "Like" ABCD Diaries via Facebook Lisa W.
I became a fan of ABCD Diarie on facebook. I follow your blog on GFC, subscribe to your email and like you on Facebook! I would love to win this! Thanks so much for the fantastic giveaway! I follow ABCD diaries via facebook. Thank you. I entered the Harvest Halloween Hop: "Junior Mystery Quest" Nintendo DS Giveaway. Liked RR farm on facebook under the name Kyoko D.
I follow Robert Rothschild Farm on Facebook under the username likwan. I tweeted about this giveaway on Twitter at https://twitter.com/#!/likwan/status/126553094099181568. #1 I've subscribed to your RSS google reader. #2 I've subscribed to your RSS google reader. I signed up to the sponsors facebook page under my facebook id Terri Ramsey Beavers. I entered your fashionista giveaway!